Propolis, The Beehive's natural protective barrier, The Propolis Intense product line contains Propolis in different forms, reflecting Propolia's know-how in creating extracts for your daily use: Powders, Mother Tincture, Solutions and Capsules. In Greek, Propolis means "before the City". It's a mix of resinous, sticky and balsamic substances collected by worker bees from the buds of certain trees. The plant resin used to build up the front of the beehive entrance as a natural barrier to protect the colony against external attacks and predators. Propolis is a mix of resinous, mastic and balsamic substances collected by bees from the buds of certain plants and trees, e.g. from poplars (especially in the French Propolis). In recent years, scientific research has focused on Propolis and highlighted its significant potential importance for human wellbeing – it is naturally unique. Containing other impurities due to beekeeping activities and the bees themselves (wood particles, dead bees, pollen, sand...), Propolis needs to be purified before use. The richness of Propolis comes from the many substances it contains. They include flavonoids, phenolic acids, aromatic acids and many trace elements which make it a product unique in nature. It is a pretty amber colour and has a viscous consistency. Bees can change the composition of their Propolis by adding secretions and wax. As a building and repair material: to glue, fill in cracks and maintain an ideal temperature for the well-being of the colony and to prevent predators from entering the beehive. As an antiseptic: to ensure a healthy environment for developing broods. The bees mummify the dead intruders they can't carry out of the hive to prevent the spread of bacteria. As thin layers: to smooth out the walls of the hive and the cells. All of these activities ensure that the Beehive is always disinfected. The ideal time to harvest Propolis is during the winter because it comes off of the frames more easily. Using perforated plastic grilles. The bees fill in the holes. Beekeepers put the grilles in a freezer where the resin becomes brittle and easier to remove. 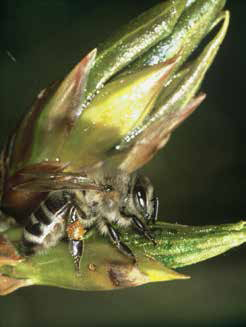 The quantity collected depends on the surrounding vegetation and the bee species. The "Caucasian" bee yields the best harvests. Each harvest provides between 100g and 300g on average per hive per year. That's an indication of just how rare and noble Propolis is! The Egyptians, Romans and Greeks were the first civilizations to discover a passion for the Propolis plant resin. The Egyptians used Propolis for sacred rites like mummification and embalming. Every Roman legionnaire took a small piece of Propolis with them for use during their military campaigns. In South America: we have clues that the ancient Inca civilization used Propolis. In Africa: Propolis was widely used for its many benefits during the colonial war (1880 and 1902) between the Boers, Dutch-speaking South Africans, and the British. In Russia: Soviet clinics used it successfully during the Second World War. Nowadays, scientists are very interested in Propolis. They have been seeking to uncover its secrets since the 1970s. Its properties continue to astound us. Many studies have been done, gradually revealing the many benefits of this incredible resin. The Propolis Intense product line contains Propolis in different forms, reflecting Propolia's know-how in creating extracts for your daily use: Powders, Mother Tincture, Solutions and Capsules.